Tall Paul, began his DJ’ing career in the late 80’s , playing for private parties at his family’s venue, Turnmills. At the same time Paul started working with pirate radio stations Touchdown FM and the capital’s legendary pirate Sunrise FM. 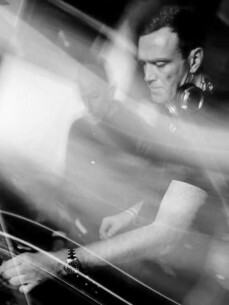 Paul also used his experience to get a one hour slot at Turnmills’ Saturday all-nighter Trade and in 1990 his obvious talent gained him his first residency at Trade , Paul quickly became recognised for playing what one might alternatively call hard edged-house. Not long after his residency at Trade, Paul was offered a residency at the Zap Club in Brighton and there met up with Shelley Boswell, which lead to regular slots at the Gardening Clubs’ “Club For Life”. In 1992 Paul put out his first vinyl offering – the white label ‘Love Rush’, a Trade anthem. He then hooked up with Hooj Choons’ Red Jerry and came up with the dance classic “Rock Da House,” (later to be re-released in 1997 on VC Recordings, reaching No. 11 in the national charts.) This dance classic is set for 2008 remix release later this year with mixes to from Fedde Le Grande. Paul then went on to produce numerous top 20 hits including the club anthems Escrima “Deeper” and “Train of Thought”, and his highest entry to date, Camisra “Let Me Show You”, entered new at No. 5. All this lead to a series of remix projects for artists such as New Order, Stone Roses, Erasure, Human League, K Klass, Wild Child, , Energy 52, Duran Duran, Nalin & Kane, Blondie, Bizarre Inc more recently , Keane and The Killlers… the list goes on. Paul’s production talents are recognised in the “DJ Magazine Top Producers Poll,” where Paul features highly year after year. Paul has continued his own production success with tracks “Common Ground”, “Be There”, “Freebase” “Precious Heart” and “Everbody’s A Rockstar”, both of which feature on Paul’s debut artist album “Back & Forth” released in November 2004 and which continues to confirm his reputation as being one of the key players in the UK dance scene. Paul has sold over 1 million compilation albums including Virgin’s “The Gallery Modern Masters”, “Club Nation 1998″ and “Cream Anthems”, and Fantazia’s “House Collection”. In 2002 Paul signed an album deal with the Ministry of Sound, with successful mixed compilations including “Dance Nation 6″, “The Ibiza Annual 2″, “Millennium Annual”, “Dance Nation 7” , “Headliners”, “The Annual” and “The Clubber’s Guide to 2001” & “2003” being released. In the U.S. the very popular mixed live series. More recently Gallery live sessions, Globetrotting Peru and live in Bulgaria and most recently The Beat Technique across America, have increased Paul’s popularity around the Globe. His popularity has seen him DJ world-wide travelling to the U.S., Canada, Japan, South America, Asia, India, Dubai, South Africa and all over Europe. Paul also continues to raise his profile in America where he tours the main cities on a regular basis. This year in particular Paul has participated in numerous tours to Asia in conjunction with the Godskitchen residency in Shanghai, China. And recently a hugely successful tour of Australia and New Zealand.